Provided photo Members of Give Where You Live of Miami County make a donation to Isaiah’s Place, a Miami County-based therapeutic foster care agency. TROY — The Give Where You Live Steering Committee members recently presented individual checks totaling $10,500 to Isaiah’s Place, a Miami County-based therapeutic foster care agency that provides training and support for foster families. Give Where You Live of Miami County is a group of women and men who have the desire to support charitable organizations impacting Miami County. The group started in 2015 and is patterned after the operations of 100+ Women. Members meet four times a year, and each member brings a blank check for $100 to the meeting. Every member can nominate a Miami County charity. Members who come to the meeting can put the name of the charity they want to speak about into the hat. Three names are drawn at random at each meeting. Selected members make a 5-minute presentation about each cause. There is then a 5-minute question and answer session about the presentations. Members then vote on which cause to support and the top vote-getting charity then receives all the checks, made out to them on the spot — all done in about 20 minutes. As of November 2018, Give Where You Live has given more than $130,000 to Miami County charities. Membership to Give Where You Live of Miami County is open throughout the year. The next meeting is scheduled for 7 p.m. Feb. 14 at the Zion Lutheran Church, 14 W. Walnut St., Tipp City. For more information, or to sign up as a member, visit http://givewhereyoulive.wixsite.com/miamicounty. You may also email questions to givewhereyoulive.mc@gmail.com. 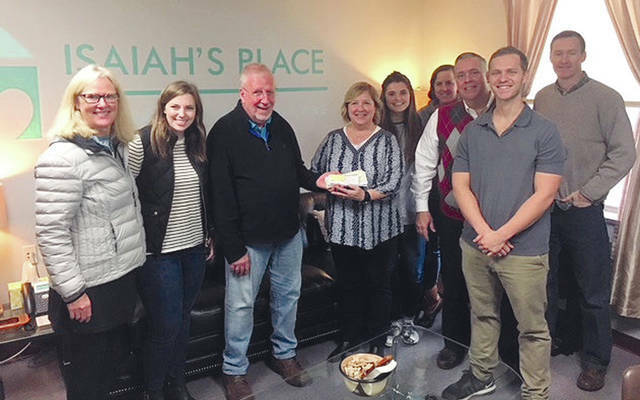 https://www.dailycall.com/wp-content/uploads/sites/30/2018/12/web1_Isaiah-s-Place-Checks-Presentation-1-.jpgProvided photo Members of Give Where You Live of Miami County make a donation to Isaiah’s Place, a Miami County-based therapeutic foster care agency.